I was over the moon when Random House said that I could interview Kenneth Oppel about his new book This Dark Endeavour which comes out in October. After reading the book I had so many questions, which luckily he didn't mind answering! Your book is about to gain immense recognition in Great Britain, how do you feel as you wait for the UK publication date? I’m very eager to see how UK readers respond to This Dark Endeavour, and hope that they enjoy it! What made you take the pre-existing classic Frankenstein and write a prequel? I love Mary Shelley’s Frankenstein; it’s a book I wish I’d written. A couple of years ago I re-read it, and the mentions of Victor’s childhood were brief but evocative. There were mentions of seeking out the Elixir of Life, raising ghosts and demons – and I saw these things as the seeds of possible stories. I spent a lot of time wondering about what might happen on such adventures, and what would motivate them in a powerful way. 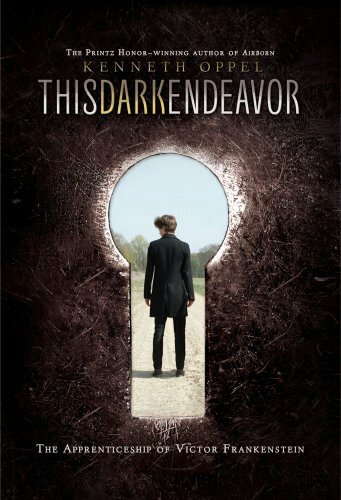 This Dark Endeavour has a very dark and spine-chilling cover, how do you like it? Do you think it captures the true essence of the story? Yes, I love the cover! Covers are tricky things, and it is rare to get a cover that you are crazy about. I think this one captures the mystery and brooding quality of the story, as well as a hint of romance: that young Victor looks like a handsome devil, after all! In the original story by Mary Shelley, Victor did not have a twin brother, what made you add one to the story? A search for the elixir of life is a great idea for an adventure, but I thought it would be even more powerful, and personal, if Victor needed the elixir to heal someone he loved. It could’ve been any family member, but I decided a brother – a twin! – would have the richest emotional possibilities. The characters really come alive in the book, which was the one you enjoyed writing about the most? Victor, hands down. He’s a fascinating character: brash, arrogant, reckless, but also loyal, loving and incredibly brave. It’s much more interesting to write about a character who has a rich range of characteristics, even if some of them are dislikeable and contradictory. Above all, he’s a fascinating, charismatic specimen, and as long as a character is passionate, readers will want to follow him on his journey. Elizabeth was also a lot of fun to write, because she’s so spirited and brave – an excellent companion (and sometimes opponent) for Victor. Elizabeth is very modern in her ways for that time period, what made you create her in that way? I borrowed from Mary Shelley herself. As the daughter of two famous radicals (Mary Wollestonecraft and William Godwin) she herself was certainly unusual for her time – she was independent, spirited, determined. I thought it made sense to model Elizabeth after her in some ways. Also, I figured if you grew up with Victor Frankenstein (and a slew of Frankenstein boys) you’d be pretty strong-willed, good at giving as good as you got, and having some pretty fierce opinions. My favourite scene within the book has to be the one where they hunt the coelacanth, what was your favourite scene to write? Action scenes are always fun to read, but for me they are often the interesting to write: there’s an awful lot of choreography and physical logistics to keep track of, and it can be quite laborious. I actually prefer tighter, more intimate scenes between a few characters. There’s nothing more exciting than two people in a room, each of whom desperately needs something, and won’t stop until he or she gets it. The love triangle between Elizabeth, Konrad and Victor really adds to the tension of the book, was that originally in your first draft, or did you add it afterwards? The love triangle was there from the very beginning. Those who’ve read Frankenstein know what happens between Victor and Elizabeth – my version provides a complicated back story, and also heightens the tension between Victor and his brother – and complicates Victor’s motivations for curing him. What can you tell us about the next instalment in the duology? It’s called SUCH WICKED INTENT and picks up several weeks after this first one leaves off. You can expect more peril, lust, and obsession bordering on madness. I understand that Summit is set to develop the book into a film. How did you feel when you found out? It was very exciting! I think it could make a wonderfully exciting film, and a visually striking one, too. I was particularly thrilled when Matt Reeves was signed as the director, because his film, Cloverfield, was one my favourite thrillers of the past decade. What involvement will you have with the film production? Probably none! Which is fine by me, as I’d rather be working on a new book! The book has a very Gothic flavour, do you enjoy reading this style of book or do you prefer other styles? I’ve always liked the Gothic – it’s very atmospheric, and I like it’s overwrought, operatic quality. It can be a bit gloomy, so I wouldn’t want a constant diet of it. Frankenstein is a favourite book of mine, but I like all kinds of styles, from magic realism to stark realism. Thank you Kenneth for allowing me to pick your brains. This Dark Endeavour is published in the UK on the 6th October. To find out more about Kenneth Oppel, please click here. Great interview. I like Kenneth Oppel's writing style so will definitely be looking out for this book - sounds fascinating! Great interview, this isn't a book that I've heard that much about, but it is one that does sound interesting. I found out about this book on another site a few days ago - can't wait to read it! MC Rogerson - Thankyou. I loved this book and I definitely want to read more of his work. Jules - thank you. I think it will appear more on the blogs in the next few weeks, especially with the film option now. Emma - you will love it. Wonderful interview. The book sounds great. Viv, your review peaked my interest.